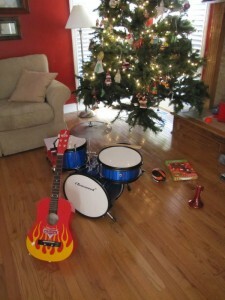 What kid wouldn’t love to come down Christmas morning to find this? 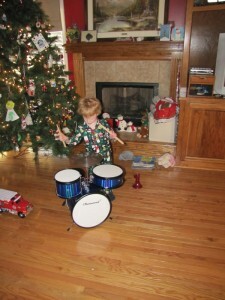 He was jamming right away. He got a cool megaphone that he calls his “all aboard”. He is wearing a scarf that was wrapped around one of my gifts. He loves the scarf and has worn it several times just for fun since. 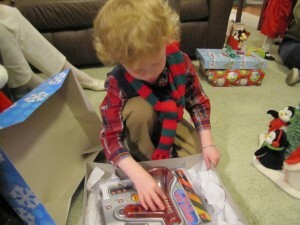 He has also loved playing with his new garbage truck, helicopter and ambulance. In other news Gabriel has been eating things other than pizza! Woo hoo! He has started eating some new chocolate cookies, cheese and pickles and puffs again. It has been nice to cook things other than only pizza. We hope that everyone is having a great holiday season! I am hoping we all have a good nights sleep tonight. Since Gabriel has starting having seizures we have been sleeping like the parents of a newborn. He is the bedroom with us. Every sound he makes, every twitch, every breath has our attention. We have had double digit days without seizures now and are starting to get back to the details of everyday life. Chuck has been working late into the night catching up on both work and school. I am exhausted from keeping up with all of the energy that our miracle medications give our little boy (Maybe another post about that coming soon). Both of us could fall asleep at the drop of the hat. We are trying to get Gabriel to sleep in his own bed again at night. We love him very much but I am over being kicked and kneed in the face 30 times a night by flailing 3 year old limbs. We decided that he might be more willing to stay in his own room, if Daddy put him down, instead of Mommy. So while Chuck put him to bed I snuck downstairs to work on filing and other quiet things. When I peeked in Gabriel’s room, an hour later, neither of them were there. I walked across the hall and found both my boys snuggled up together in our big king sized bed sound asleep. What a beautiful sight! I wanted to take a picture but figured the flash would ruin the experience for all of us. So…even though I will probably get whacked a few times while sleeping tonight…I am hoping tonight is the first night all the members of my family get a full nights sleep. Tomorrow is Easter morning………a time to celebrate all God has done to redeem the world. I am so thankful as He daily guides, strengthens and redeems my family. He has not had a seizure since 2 a.m. Thursday morning. That means 3 days. Our pattern so far has been…new medicine 2, 3, or 4 good days and then seizures. We are cautiously optimistic….but on high alert for seizures. It is a challenge to be fully present and enjoy the good moments.